Chaplain Jim Murray with his wife, Ashley, and daughter, Margo. News from the Eagle Commission, for those who support the Grace Brethren military chaplains, will soon be in the mail. Here is a sampling of some of the news that will be included. Capt. 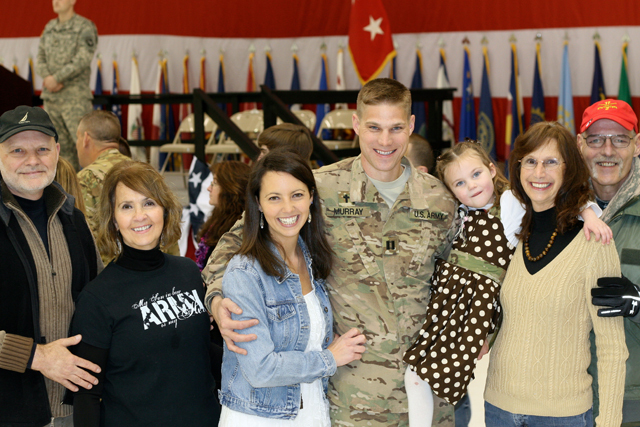 James Murray (U.S. Army) returned this month to Fort Campbell, Ky., after six months in Afghanistan. Below is a note from Ashley shortly after his arrival home. We just wanted to send out a quick update that Jim arrived home to Fort Campbell, KY on Friday, March 1st! 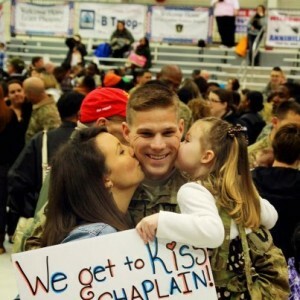 Thank you all for your prayers, support, and love during this deployment and transition time. We are praising the Lord for the work that He has done through Jim and look forward to connecting more with all of you in the coming weeks! The picture is of Jim’s and Ashley’s parents who came from South Carolina to attend Jim’s homecoming ceremony! As we welcome Jim home, we continue to pray for his Grace Brethren Chaplain colleagues, Pete Stone and Bill Graham, who remain for a time in Afghanistan.